When I was a kid, I never much bothered by the fact that Iron Man (whose superpowers were technological in origin) could fight side by side with Thor (whose superpowers were alien-science-appearing-as-magic in origin) and Dr. Strange (whose superpowers were purely magical in origin) to fight against Dr. Doom (who wielded both advanced technology and magic). So long as the story involving these four characters was compelling to me, what difference did it make? As I got older, I became much more hung up over "genre" distinctions, due to the dual influences of some of the older gamers I knew and, more insidiously, English teachers. From that point on, I became a lot more dismissive of entertainments that didn't share my new fastidiousness toward keeping fantasy chocolate out of my science fiction peanut butter (or mixing any other two genres, for that matter). Older still, I find myself caring less and less about such literary miscegenation. Indeed, I find myself reveling in it, which is why, for example, the setting of my Dwimmermount dungeon includes lots of elements my younger self would almost certainly have abhorred. 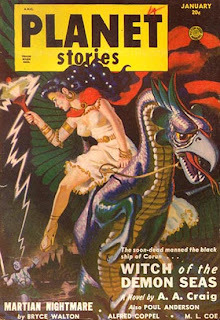 I bring this all up because of the history behind today's pulp fantasy story, "Witch of the Demon Seas." Written by Poul Anderson using the pseudonym A.A. Craig (because he already had another story under his own name in the same issue), it was published in January 1951 issue of Planet Stories. Planet Stories, as you may know, was a pulp magazine that ran from 1939 to 1955 and whose stories were devoted to "planetary adventure." This category could include space opera or sword-and-planet yarns but it could not include "straight" fantasy. Consequently, Anderson's tale was given the thin veneer of being a science fantasy tale set on a far away planet so that it might be salable at a time when pulp magazines of any sort were drying up faster than the seas of Barsoom. That said, "Witch of the Demon Seas" is not lessened because of Anderson's willingness to make a few fleeting references that pleased the editors at Planet Stories. The story opens with Khroman the Conqueror, thalassocrat of Achaera, pondering what to do with the pirates he has just captured, in particular one named Corun, whom Khroivian respects after a fashion. "What will you do with them, sire?" asked Shorzon the Sorcerer. Khroman shrugged heavy shoulders. "I don't know. Pirates are, usually fed to the erinyes at the games, I suppose, but Corun deserves something special." "Public torture, perhaps, sire? It could be stretched over many days." "No, you fool! Corun was the bravest enemy Achaera ever had. He deserves an honorable death and a decent tomb ..."
"Your help in a desperate venture," said Chryseis. "I tell you frankly that we may well all die in it. But at least you will die as a free man—and if we succeed, all the world may be ours." "What is it?" he asked hoarsely. "I cannot tell you everything now," said Shorzon. "But the story has long been current that you once sailed to the lairs of the Xanthi, the Sea Demons, and returned alive. Is it true?" "Aye." Corun stiffened, with sudden alarm trembling in his nerves. "Aye, by great good luck I came back. But they are not a race for humans to traffic with." "I think the powers I can summon will match theirs," said Shorzon. "We want you to guide us to their dwellings and teach us the language on the way, as well as whatever else you know about them. When we return, you may go where you choose. And if we get their help, we will be able to set Conahur free soon afterward." Corun shook his head. "It's nothing good that you plan," he said slowly. "No one would approach the Xanthi for any good purpose." "You did, didn't you?" chuckled the wizard dryly. "If you want the truth, we are after their help in seizing the government of Achaera, as well as certain knowledge they have." If Corun agrees to help the father and daughter, since they promise him not only his own freedom but the liberation of his homeland, currently subjugated by the Achaerans. Like any good barbarian, Corun is suspicious of his supposed benefactors but is also unwilling to let a chance like this slip through his fingers, thinking it better to die a free man engaged in a desperate adventure than executed as a prisoner. What follows is a very enjoyable story well told, one that feels more like Robert E. Howard than Poul Anderson, filled as it is with swashbuckling combats, duplicitous alliances, and eldritch horrors. On the other hand, Anderson has always been good at producing interesting and believable characters, even when those characters are very "archetypal" as those in this story are. The same is true of the plot, which manages to be genuinely surprising at times, despite the clichéd nature of its set-up. "Witch of the Demon Seas" is thus a good example of the kind of pulp fantasy tale -- fun, fast-moving, and engaging -- I like to read. Haven't read this one myself. I don't care much for Poul Anderson anymore, even his 'classics' but maybe he did something with this story, which sounds pretty awful, that would be worth mining for ideas. Are you sure that Thor's powers are "alien science"? It seemed that way in the Avengers movie, but in the old comics it seems like the gods are meant to be actual gods. Yeah, Thor (and other mythological figures at Marvel) was originally intended to be exactly what you thought he was - a God of Thunder who was part of a pantheon of gods. The idea of the Asgardians being aliens whose science made them appear as gods is something that came years later and was seized on by the Marvel filmmakers precisely because they feared the broader audience wouldn't accept magic peanut butter in their sci-fi chocolate. I'd like to read this story and more of Anderson's early pulp fiction, but I get the impression that they often get left out of anthologies for some silly reason. The notion that Thor and the Asgardians were aliens/extra-dimensional beings rather than "true" gods was current in the 70s, when I first started reading comics. I'll leave it to others better versed in comics as to whether it was original or not, though it's worth noting that Jack Kirby was, by the late '60s, if not before, a believer in and promoter of "ancient astronaut" theories. Because the Norse, Egyptian and Greek gods (at least) are real in the Marvel universe, that implies that Earth has been visited a lot. Although I suppose that aliens are always turning up in Marvel comics, so it makes more sense there than in the real world.